Lake Ndutu at sunrise with running Blue wildebeest (Connochaetes taurinus) during the Great Migration, Serengeti, Tanzania. I think the mountain in the background is Mt Lemakarot. Fine wildlife shot !! Love the low light mood of the image !! What a beautiful sight to see to start the day. Very well captured. What an exciting moment, to see the wildbeest running along the water's edge. Great capture of the moment. 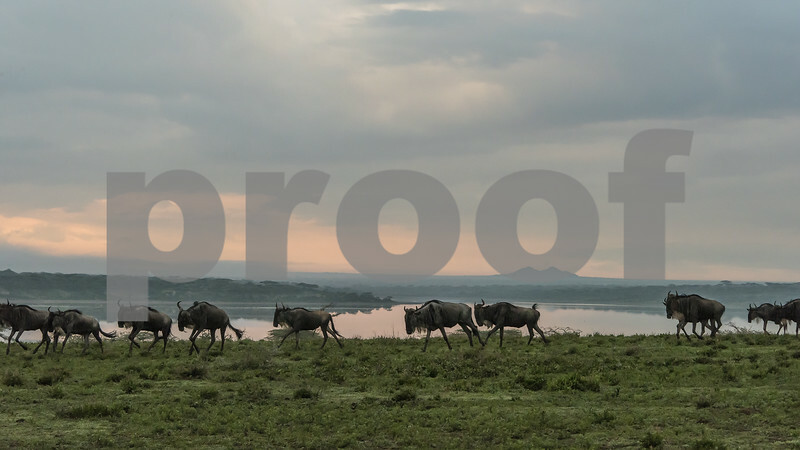 Great shot of the wildebeest running at sunrise...lovely subtle light! Regarding your question about the ripples on the tanks, I think it may be moire artifacts. I shot it from our moving car and did not notice anything until I was processing them. I kind of liked the effect so did not attempt to remove it.